After two years of four-member comeback promotions, EXID have reunited as five once more with main vocalist Solji for their latest single, “I Love You.” Despite the renewed sense of unity amongst the team, the five girls return with a song whose sounds lacks that same type of wholeness. That may not be an entirely bad thing, however. I went into “I Love You” believing for the first hook that EXID was deviating from the admittedly successful formula they’ve used in their past comebacks. The droning “I love you like,” has a similar kind of robotic tone as “DDD’s” chorus that was catchy while still being a little off-putting and I loved that. But when the song actually transitions to Hani’s opening vocals, the instrumental is only barely reminiscent with that of the beginning. It’s really when the chorus hits, however, that things really go off the rails. 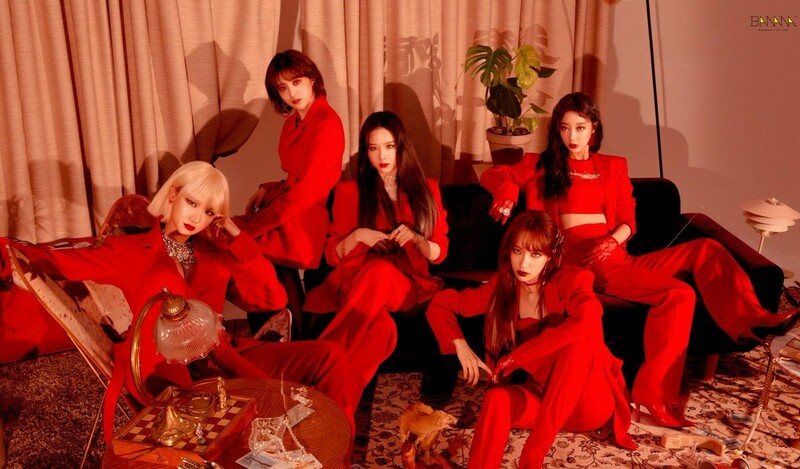 The chorus itself is heavily focused on vocals, as has become typical for EXID songs, and retains none of the original instrumental or even motifs of the first part of the song. Hyerin and Solji take their respective splits of the chorus, with Hyerin leading and Solji following as usual. It’s only when the chorus concludes we actually return to the “I love you like,” hook but it’s just as jarring as the initial transition. Overall, “I Love You” sounds to me like four different songs spliced together. And don’t get me wrong – each part of the song on its own would make a singular track that ranges from good to fantastic. But together, it’s admittedly a little discordant. The second verse alone sounds like two entirely different songs, with the first half being a combination of Hani’s sultry vocals and LE’s rap and then a complete change of instrumental and tempo that Junghwa covers. It’s enough to give you whiplash, and the chorus that quickly follows is just a different. In the weirdest way, this song is formulaic and yet totally experimental. And I’m still trying to wrap my head around whether I jive with it even after a more than a few listens. To go on a slight tangent, I want to say that I am a firm believer that equal line distribution does not equate to a better song. In my opinion, the members who are most musically gifted should be given precedence to capitalize on their talents and produce an overall stronger piece of music that is enjoyable to listen to. However, I will note just how remarkable EXID’s line distribution has become in recent years, and especially with this comeback. Solji is unarguably the strongest vocalist of the group, Hani has long since become the center, and LE is one of my personal favorite female idol rappers in K-Pop – but this collection of talent and charisma doesn’t overshadow Hyerin and Junghwa in the least. Junghwa carries her lines well and had me cheering as she took the center stage during the chorus while Hyerin has really stepped up into her role as the main vocalist in Solji’s absence and her elevated confidence is evident with this song. All five girls work as a unit so well, and I think that’s why I enjoyed this comeback so much despite the song itself being a wild ride, and a bit of a mess, upon first listen. "I Love You" is EXID's most experimental comeback yet, but it doesn't quite deliver that full catchy hook the girls are known for given the songs' fragmented nature and lack of cohesiveness. However, the group showcases a new sense of unity with their comeback as a full team and each member gave their all for their respective parts. Ind the end, LEGGOS may find themselves enjoying "I Love You" quite a bit more than a casual listener looking for an easy listen.